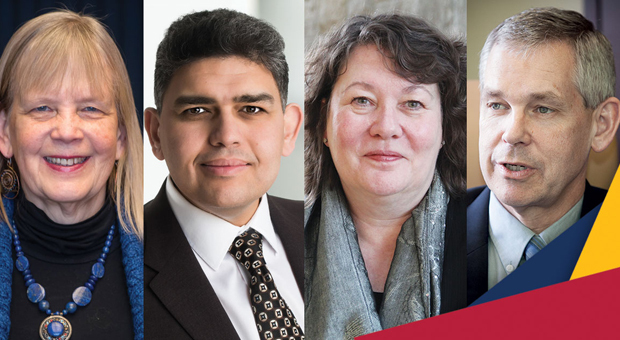 (Left to right) Dr. Rena Upitis, Dr. Ahmed Hassan, Dr. Heather Stuart, and Dr. Stephen Archer have been elected to the Royal Society of Canada. Stephen Archer, Meds'81, Artsci'87, Heather Stuart and Rena Upitis, Artsci'81, Law'81, MEd'82, were elected to the Fellowship, while Ahmed Hassan was named a member of the College of New Scholars, Artists and Scientists. Dr. Stephen Archer (Medicine) is Head of Medicine at Queen’s University and a world-renowned cardiologist and leader in several research fields, including oxygen sensing, vascular biology, and the experimental therapeutics of pulmonary hypertension and, more recently, cancer. He has made numerous discoveries that can undisputedly be considered firsts, particularly in regards to defining the roles of mitochondrial fission/fusion and metabolism in oxygen-sensing and cell proliferation. Dr. Heather Stuart (Public Health Sciences), the Bell Mental Health and Anti-Stigma Research Chair, is a social-epidemiologist and award-winning researcher who has developed world-recognized translational research to reduce mental illness-related stigma. Coupled with novel partnerships with professional, governmental, and private enterprises, her research has allowed for the development, implementation, and evaluation of best practices designed to reduce stigma, promote recovery, social equity, and to influence mental health policy. Dr. Rena Upitis (Faculty of Education) is a dynamic arts education scholar of international stature. Driven by a desire to build deep connections with the natural world, her work involves experiential learning, research, and social activism. Taking a holistic approach to human development, she has cultivated many spheres of expertise: arts education, digital literacy, mathematics education, curriculum development, sustainability studies, and architectural design. Her contributions have influenced educational practices in North America and globally. Dr. Ahmed Hassan (School of Computing) is the Canada Research Chair in Software Analytics and the NSERC/Blackberry Industrial Research Chair in Software Engineering at the School of Computing at Queen’s University. He is a Canadian pioneer and recognized world leader in the engineering of ultra-large-scale systems. His track record of industrial collaboration has yielded numerous patents and innovations that are integrated into products and services used daily by millions of people worldwide. The scholars will be formally inducted as Fellows and Members of the College at the RSC’s Celebration of Excellent and Engagement, November 15-18, in Halifax. For more information, visit the RSC website. This article originally appeared in the Queen's Gazette.